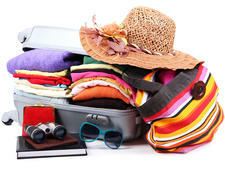 What carries 2,500 passengers, entertains kids and adults of all ages and cruises the Caribbean? 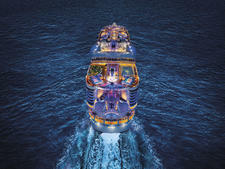 The answer would be Disney Cruise Line's newest ship, Disney Fantasy, which debuted in 2012. It has high-quality stage shows, adults-only gourmet restaurants, cruise rooms designed with families in mind, a spacious and elaborate kids club and all the Mickey and Disney Princess character appearances and movies a fan could wish for. Follow these Disney Fantasy cruise tips to make the most of your time onboard -- and have a memorable cruise vacation. 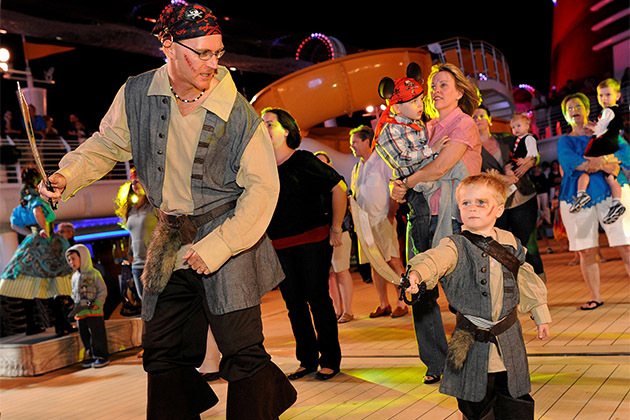 Every Disney Cruise has a Pirate Night, with evening shows for both kids and adults, culminating in at at-sea fireworks display. If you're feeling shy about being the old person dressed for the event in pirate-wear, don't be. Disney cruisers go all out, with costumes ranging from homemade (ripped T-shirts and bandanas) to the professional (including matching family outfits). 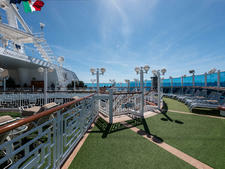 Disney Fantasy's top decks are chock full of water play areas, geared toward every age. Toddlers who aren't yet potty trained can splash in the Nemo's Reef splash area, and young kids can play in Mickey's Pool with its gentle slide. The main Donald's Pool is the place to watch movies on the giant LED screen, while the Quiet Cove offers pools, hot tubs and wading areas for grownups only. For a bigger splash, ride the AquaDuck water coaster, or get doused in the AquaLab water play and spray zone. On Disney Fantasy, hallway art isn't just for decoration. Certain pieces are dubbed Enchanted Art; they're digital, and the animations are activated by motion. (Look for slightly different frames, and then wave your hands.) Find a Midship Detective Agency kiosk, and you can go on a Muppets-themed scavenger hunt, where the Enchanted Art holds the clues to solving a mystery. 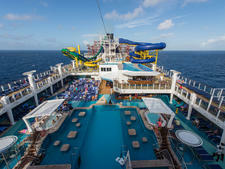 It's a great way to explore the ship, especially on cool or drizzly days. 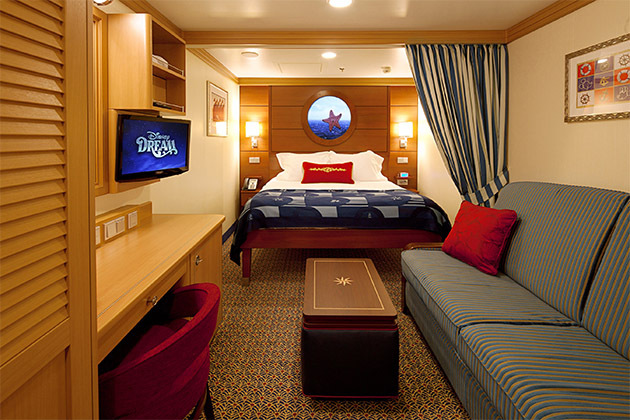 Disney Fantasy sailings are definitely pricey, but this is a ship where you might actually enjoy saving money on an inside cabin. Interior rooms are quite spacious for the industry, sleep three to four and feature room-dividing curtains (useful when someone is sleeping on the convertible sofa). All come with Magical Portholes, round windows that show real-time outside views, enhanced with the occasional Disney animated character floating by. Cabins have showers and bath tubs, and deluxe insides also offer Disney's popular split bath setup. 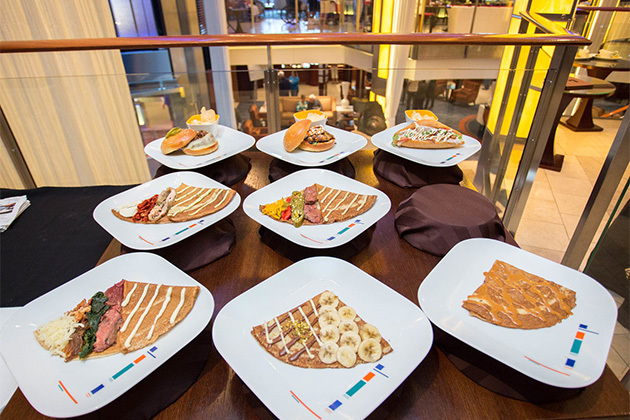 Disney's unique dining rotation system means you can eat in a different restaurant each night. If you're thinking about skipping out for dinner at Palo or the buffet, make sure you don't miss your evening in Animator's Palette. 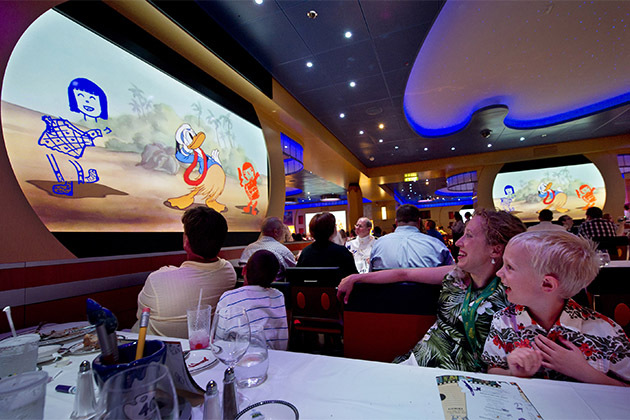 The animated entertainment is fabulous; either Crush the Turtle from "Finding Nemo" will interact with passengers, or diners will be invited to draw characters on their placemats, and those drawings will come back dancing and singing on the multiple video screens around the room.